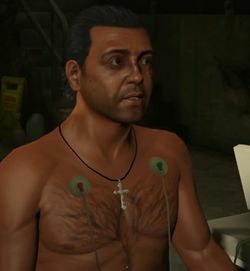 Ferdinand Kerimov is a character in the HD Universe appearing as a minor character in Grand Theft Auto V. He is voiced by Armin Amiri. Kerimov is an Azerbaijani man who makes his living installing cinema-quality home audio/visual equipment. At some point prior to 2013, he was under observation by the International Affairs Agency and eventually arrested and put under IAA custody. Federal Investigation Bureau Agents Steve Haines and Dave Norton have reason to believe that Kerimov holds information which would expose Agent Haines' and Agent Norton's corrupt affairs. According to Agent Norton, the Agency claims that Kerimov is dead; however, the Bureau believes this to be false. Agent Norton has Michael De Santa infiltrate the coroner's office to confirm this suspicion. After verifying that Kerimov is still alive, the Bureau has Michael, Trevor Philips, and Franklin Clinton kidnap Kerimov from IAA custody. While in FIB custody, Agent Haines and Trevor torture Kerimov to get information about a suspected Azerbaijani terrorist named Tahir Javan. After Michael and Agent Norton kills Javan, Agent Haines wants Trevor to kill Kerimov, claiming that he's outlived his usefulness; however, Trevor drives him to Los Santos International Airport and tells him to flee the country. This page was last modified on 22 May 2015, at 22:47.